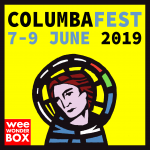 weeWONDERBOX is a series of face-to-face events, most of which take place in The Ground, the event space of the Iona Community Base at 21 Carlton Court, Glasgow. It’s a collaboration between the Iona Community’s Programme team and the Wild Goose Resource Group. If you wish to receive the latest updates on the 2018-19 programme as soon as they’re available, you can sign up to our regular eNews here. Follow weeWONDERBOX on Facebook, Twitter; or subscribe to our RSS feed.